Amanda gives a voice to those who should be heard. Her artwork provokes, challenges and unhinges traditional paradigms to prompt her audience to reevaluate their stance on contemporary issues. As an artist Amanda's work examins the role and influenece of women within society; she is a passionate feminist who believes in questioning the treatment and representation of women throughout history. Her multidisciplinary approach has generated 2nd and 4th wave feminist content in ceramics, performance, video and sculpture. Similarly, Amanda is concerned about the loss of biodiversity in the environment; much of her artwork urges her audience to question their stance on the depredation of our ecosystem. Currently, Amanda is experimenting with ways in which she can bring these two issues together. Her method: to create "larger than life" size works. By creating mountainous sculptures she is directly representing the size and severity of the issue, ironically, Amanda is addressing the elephant in the room, by making it, well, as large as an elephant. Glaze making is a pivotal part of Amanda's work; she creates glazes that emphasize the contradictions of the clay surface, whilst also experimenting with it's materiality. She is very interested in the chemical process of creating glazes and strives to exclusively use her own independent palates. Amanda has completed a Masters In Fine Art at the National Art School in Darlinghurst, Sydney. Her supervisors were ceramicists Stephen Bird and Jenny Orchard. Amanda has a Bachelor of Arts - Diploma in Education, a Diploma in Fine Arts and a Diploma in Ceramics. She has also completed her postgraduate studies in Visual Arts in Ceramics at The School of Art at The Australian National University in Canberra. 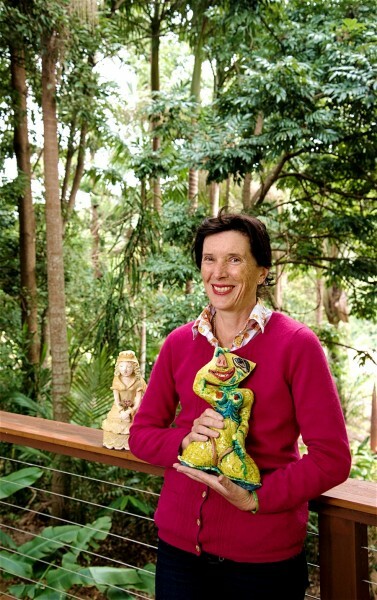 Whilst at the ANU she was mentored by internationally renowned ceramicist Greg Daly.